Today our topic is the best diet and fat loss strategies or habits for when you want to lose a LOT of weight, like 40 lbs., 50 lbs., or more. You’re starting at square one, it can feel a bit daunting. Experts might say stuff like “start small, focus on the longterm,” but even though that’s good advice, it’s hard to follow. If oyu want to lose the wieght you want it gone–yesterday. but rushing things just leads to unhealthy behaviors. I have a few questions. 1) How do you approach substantial weight loss (50 lbs or more). 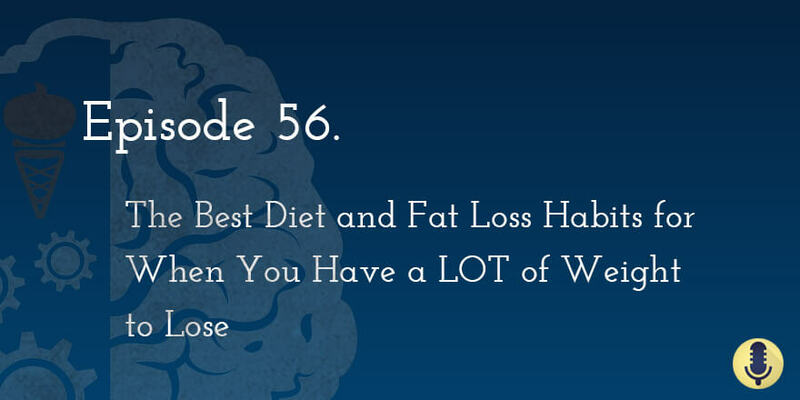 2) When approaching substantial weight loss, what are some common mistakes? 3) Are multivitamins useful? 4) is fish oil useful? 5) is Splenda okay and or is stevia better? The big thing is getting away from a focus on numbers. Scott especially doesn’t like group weigh-ins. Re-frame things as a challenge. Lifestyle isn’t a goal, it’s a forever thing. Mike recommends focusing on one key big win — for him, that’d be a meal plan with healthy whole foods that puts you in a slight relative caloric deficit. For Mike, common mistakes include trying to do way too much, way too quick. Focus on the one big win (e.g. a meal plan) and get that right. Many people try to do it all, and crash and burn, either because they quit after trying to create a total lifestyle change in a day, or because they actually do manage to do a million things all at once, but then when they run out of energy and they’re sick and tired… there’s no where for them to go. They want to know what to do to get past the plateau, but at this point there’s not much any coach can recommend except focusing on metabolism. The one key that we kept coming back to was focusing on staying in a state of good energy, and tolerable hunger, and then accepting that there is an ebb and flow to energy and weight loss. This means you need time off, and you need to not see that as “one step back to take two steps forward” (because then your mind will play tricks on you and focus way, way too much on that one step back) but rather as a step forward in itself. This only happens when you reframe things, and stop seeing the goal as the weight loss per se, and seeing the goal as vigilantly coaxing your body to get leaner. Be vigilant about staying in the sweet spot of hunger, not about losing weight ASAP. Don’t panic about a plateau. Stuff is happening under the surface. We repeat: stuff is happening under the surface. Don’t cut calories and up the cardio. You’ll drive yourself into the ground, and that is NOT sustainable. 1) How long of a period of time does being in a RELATIVE caloric deficit eventually begin to cause some down-regulation of, or have a negative impact on, the metabolism, when there is not a refeed (as Mike alluded to in a recent podcast episode)? 2) Will Scott begin prescribing that person some refeeds (whether a meal/half day/full day) just to prevent down regulating in hormones/metabolism or even just for mere psychological purposes even though the individual isn’t in supercompensation mode? If yes, how often and why?